Ipswich boss Mick McCarthy has said he had a stern conversation with striker Frank Nouble in the lead up to his goal-scoring appearance at the weekend. "I'm delighted for Frank because I had a serious growl at him in training. He wasn't happy but has responded," McCarthy told BBC Radio Suffolk. "I've said to him, 'that's when you can look me in the eye and tell me you're doing it properly'. He was excellent." Nouble joined Ipswich from Wolves in January, but has started just three games this season and stepped off the bench to net his first goal of the campaign. Paul Taylor, who has spent the early part of the season on loan at Peterborough United after a spell out with a foot injury, also came on to record his first strike for Town. He would go on to take the corner that provided Daryl Murphy for a dramatic injury-time winner that moved Ipswich to within four points of the play-offs. 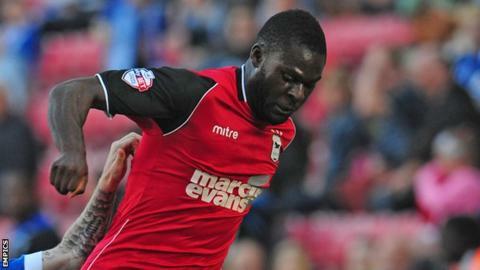 "They both want to play, both probably think they should play," McCarthy said of Nouble and Taylor's substitute cameos. "We spent a lot of money on Tayls. A million quid or something - maybe more. He had a terrible injury. "His goal was brilliant and we scored off his corner. He's a great player and it's good to have him back."